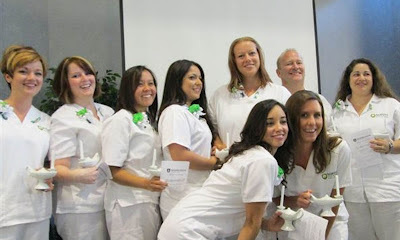 Rasmussen College’s inaugural graduating class of registered nurses was honored in a Pinning Ceremony at the Hope Hospice House in Cape Coral. This hospice house is one of four operated by Hope HealthCare Services in Lee County and the venue where the nurses participated in their first clinical experience. The 11 nurses-in-training were able to gain practical experience with patients, according to Jackie Houle, dean of nursing at the college’s Fort Myers campus. As part of the two-year-old nursing program at Rasmussen, students complete 570 hours of clinical experience to earn an associate degree. At the hospice house, students learn fundamental skills, including bathing, mealtime assistance, transporting patients and administering medications, Houle said. Rasmussen’s nursing program, launched in the summer of 2010, currently has 191 nursing candidates who will complete their fundamental clinical experience at a Hope Hospice House. The college has been approved to offer degrees in licensed practical nursing beginning in October. In addition to the associate RN degree, the school also provides an LPN-to-RN mobility program that allows LPNs to transfer credits toward an RN. Transform normal image into a mesmerizing art work. Diamond painting helps you to design beautiful and realistic landscape. Amazing beauty and the beast fan art. This is so helpful post and great information. Thanks for shearing with us. Good blog it is. Ever saw beautiful animal diamond paintings? Checkout these beautiful white tiger painting.